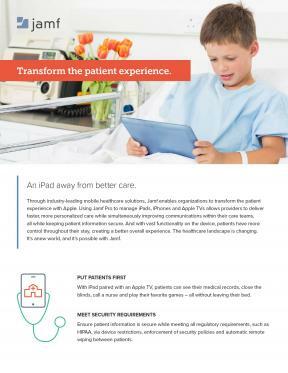 Through industry-leading mobile healthcare solutions, Jamf enables organizations to transform the patient experience with iPad. Using Jamf Pro to manage iPads, iPhones and Apple TVs allows providers to deliver faster, more personalized care while simultaneously improving communications within their care teams, all while keeping patient information secure. And with vast functionality on the device, patients have more control throughout their stay, creating a better overall experience. The healthcare landscape is changing. It’s a beautiful new world, and it’s possible with Jamf.